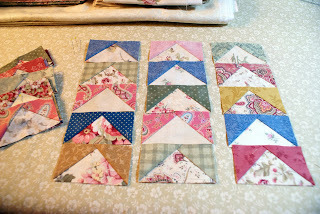 I've made lots of these flying geese blocks and I'm excited about the way I see this quilt coming together. Of course, while I was laying out the flying geese to sew into sections, Ted decided I needed a little help. 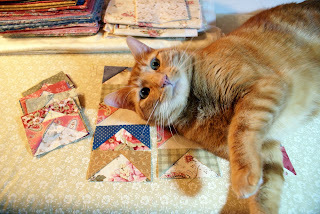 If he gives me some space I should have a couple of full quilt blocks done this weekend. Those are beautiful! 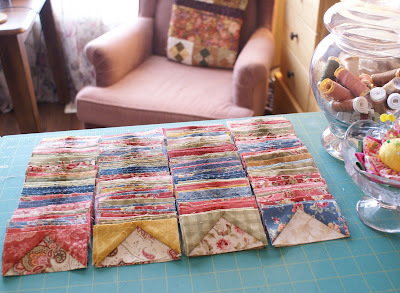 Are you doing foundation paper piecing? I'm getting ready to do a Dutchman's Puzzle quilt and am swaying between that and the speed piecing method that makes 4 at a time. I can't wait to see your final quilt! Yummy soft colour fabrics .... I wonder what your quilt top will look like? Sweet kitty! Oh, I love your flying geese! And Ted is just beyond CUTE! I see Ted enjoys helping you with your projects! Your flying geese blocks look wonderful!